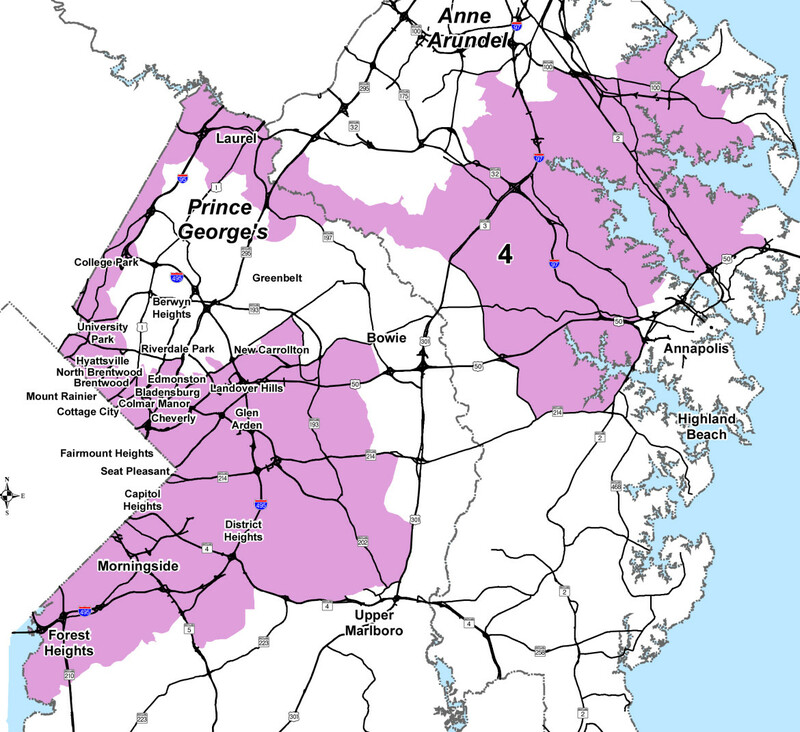 Map by the Maryland Department of Planning shows Congressional District 4 as of 2011. Map above: Congressional District 4 as of 2011, by the Maryland Department of Planning. The 4th Congressional District, which was reconfigured during Maryland’s 2011 redistricting process, used to be home to voters in parts of Montgomery and Prince George’s Counties where Democrats had significant representation in both counties. Today, the District represents 264,000 Democrats in Prince George’s and 46,000 Democrats in Anne Arundel. While political strategists agree voters in Anne Arundel cannot be ignored, one expert in the field says the race is primarily about Prince George’s — where 85% of the District’s Democratic voters live. The primary election, which is scheduled for April 5, 2016 Correction: April 26, 2016, is seen as the defining election for this congressional district where Democrats outnumber Republicans more than 4 to 1. The primary election date was corrected 2:40 p.m. Tuesday with an updated date because the State Board of Elections had the previously scheduled election date on its website. The new primary date is not yet law because it has passed both houses of the legislature but still awaits the governor’s signature. Five Democratic candidates have so far surfaced to replace U.S. Rep. Donna Edwards, who is vacating her seat to run for retiring U.S. Sen. Barbara Mikulski’s seat. Former Lt. Gov. Anthony Brown, who lives in Prince George’s, Del. Dereck Davis, Prince George’s, Del. Joseline Peña-Melnyk, Prince George’s and Anne Arundel, former Prince George’s State’s Attorney Glenn Ivey and former Prince George’s County Council member Ingrid Turner have said they will run. “You want to appeal to Anne Arundel, but you want to solidify your Prince George’s County base first because that’s where you’re going to take the majority of the votes,” Morrill said. Ivey campaign volunteer Susan O’Brien, who managed a county council campaign that overlapped in District 4, said she believes Anne Arundel voters will make a difference in the election because multiple candidates could easily split the vote in Prince George’s. “I feel the one who campaigns the hardest and wins the most voters in Anne Arundel can absolutely make the difference in a very divided Prince George’s voting,” said O’Brien, who lives in the Anne Arundel portion of District 4. In 2014, O’Brien’s candidate Patrick Armstrong, D, garnered 47% of the vote in a district where Republicans and Independents made up 64% of the electorate. Terry Speigner, the Prince George’s County Democratic Central Committee chairman from 2008 to 2014, said he believes Anne Arundel Democrats will be a factor, but the message to voters will be different. Seventy percent of District 4 Prince George’s Democrats are black, while 86% of Dist. 4 Anne Arundel Democrats are white and considered to be more affluent and more conservative. Since June 2014, Democratic Party voter registration has dropped by 6% (-16,796) in Prince George’s while unaffiliated voter registration increased over 200%, from 10,356 to 31,820, according to data from the State Board of Elections. Republican Party registration decreased in Prince George’s by 6.5% (1,193). Anne Arundel saw a 5% (1,274) increase of unaffiliated voters, while Republican registration increased 2% (1,151) and Democratic registration changes were nominal. Ivey had an impressive first quarter fundraising total, and Brown enjoys statewide name recognition, but political experts say it is still too early to determine a frontrunner in the race, because the race is still wide open. Names that have been floated as possibly still joining the race include: Prince George County Sen. C. Anthony Muse, Prince George’s Delegates Kriselda Valderrama, Geraldine Valentino-Smith, Michael Vaughn and Jay Walker, Prince George’s County Councilwoman Andrea Harrison, former Prince George’s County Del. Melony Griffith, former U.S. Congress District 4 candidate Warren Christopher and Dr. Alvin Thornton. It was an old-fashioned funeral service for an old-school lobbyist at the Old Wye Church in Talbot County Friday afternoon. More than 150 Annapolis insiders, family and friends bid adieu to Jeffrie Zellmer, 73, who represented the Maryland Retailers Association at the State House for the past 20 years.